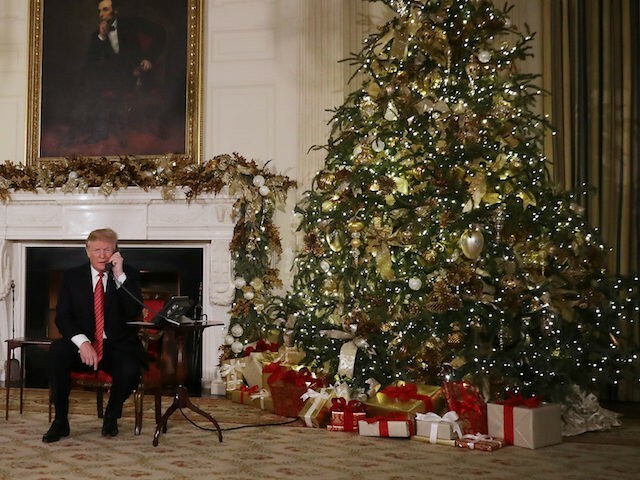 President Donald Trump said the United States needed more border security, during remarks to reporters on Christmas Day at the White House. The president spoke to reporters after calling the troops from the White House on Christmas Day. Although members of Congress left town for Christmas despite failing to pass a bill funding the government, the president remained at the White House instead of going to Florida. Trump said it was unclear when Democrats would allow the government to reopen. “I can tell you it’s not going to be open until we have a wall, a fence, whatever they would like to call it,” he said, calling for a barrier to protect the Southern border. Trump praised existing construction of replacement walls on the Southern border, promising to visit the site in January. “We’re almost having a groundbreaking, it’s such a big section,” Trump said. He promised to keep fighting for wall funding. “It’s my hope to have this done, completed — all 500 to 550 miles — to have it either renovated or brand new by election time,” he said.